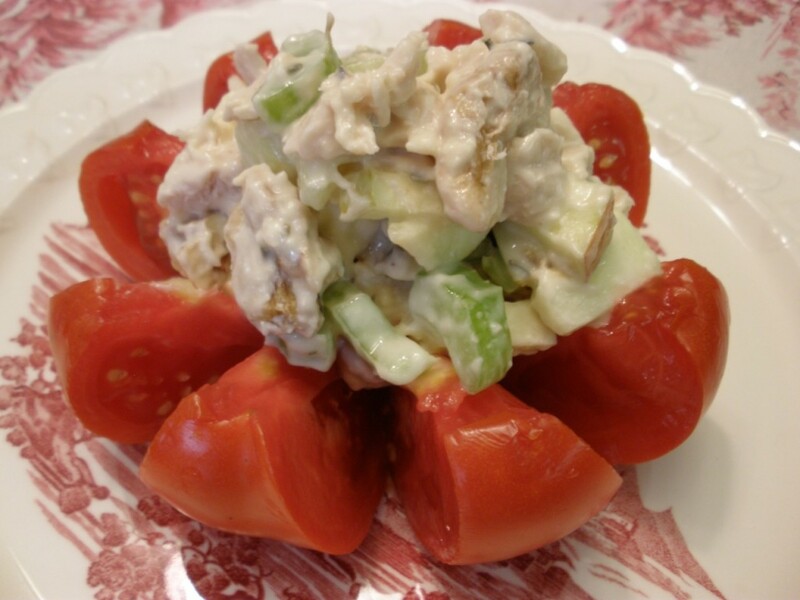 This recipe for hot chicken salad reminds me so much of my new favorite veggie casserole! Before you think I’ve mixed up my fowl and my veggies let me explain. Every once in a while I eat something that I just can’t get enough of. It is usually when lots of people are around and I either make a complete pig of myself or I restrain and then can’t wait to get the recipe and head to the kitchen! My friend Sue has always called me a chicken eater because I really do like most everything CHICKEN! But chicken salad usually puts me over the moon. Such is the case with my sous-chef dish-washing mom’s chicken salad. Yum. But hold the fork … make way for my new favorite hot chicken salad! 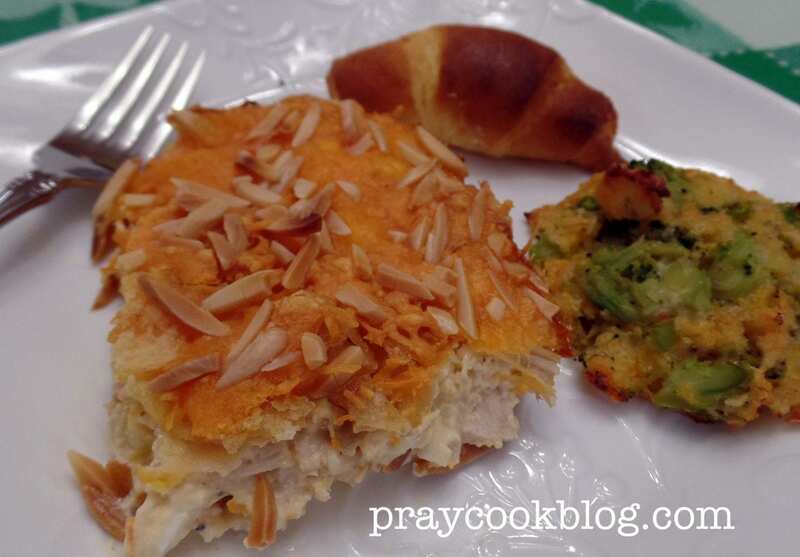 This recipe came from my friend Dinah and she received it from a friend of hers. I am changing the name to Friends Hot Chicken Salad! 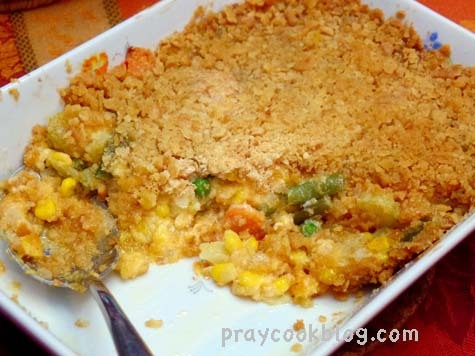 The great taste totally disguises the ease of making this dish. This is a make-ahead dish and the flavors meld nicely overnight. 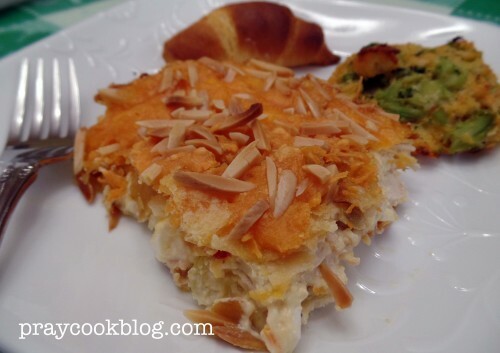 It is an absolutely perfect luncheon dish which I have now served several times! The last time I served the hot chicken salad, I paired it with a broccoli patty and a hot fresh-out-of-the-oven croissant! P.S. Bobbeye, Mary and Jan — this is for you! Hot Chicken Salad is over-the-top delicious, incredibly easy and one of those recipes everyone requests! This is a make-ahead dish and the flavors will meld nicely in the refrigerator overnight. Combine all ingredients except the last 3 topping ingredients. Place the mixture in a lightly greased 9"x13" baking dish. 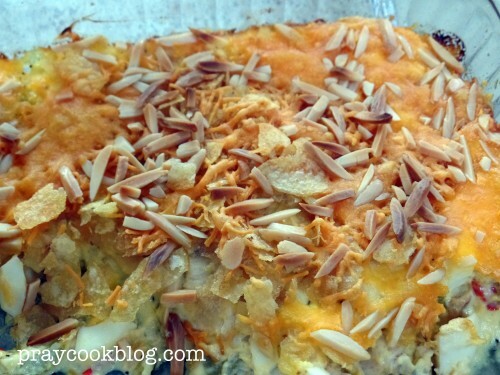 Top with the crushed chips followed by the shredded cheese and slivered almonds. Remove plastic and bake at 400 degrees for 25 to 30 minutes until hot and bubbly.